Bring apple juice to a boil, add strawberry slices, simmer for 30 seconds. Remove strawberries from heat, stir and set mixture aside to cool. 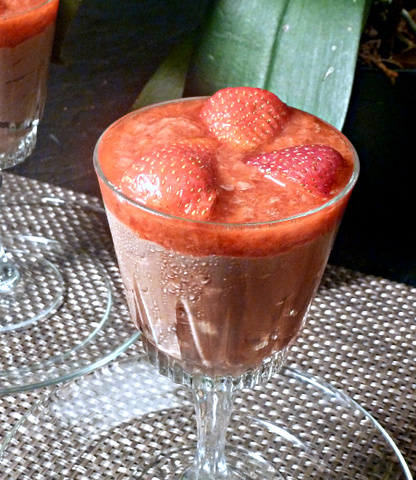 When strawberry mixture is room temperatore, place in a blender or food processor and pulse 2 or 3 times. Mixture should be chunky. Place in a bowl, cover and refrigerate. Unused apple juice can be stored in small containers and frozen for later use. Place banana in food processor, pulse several times, scraping down the sides. Add the tofu and all the other ingredients. Blend mixture, scraping down the sides, until well blended. Taste for sweetness. Add more Stevia if needed, pulse again. Refrigerate several hours or over night until pudding is set. Garnish: 5 strawberries, washed, trimmed and cut into 4 pieces each. To assemble the dessert, place chocolate pudding in the serving dishes, spoon the topping on the chocolate pudding and garnish with 3 strawberry pieces each.